Yes, you read the title correctly. 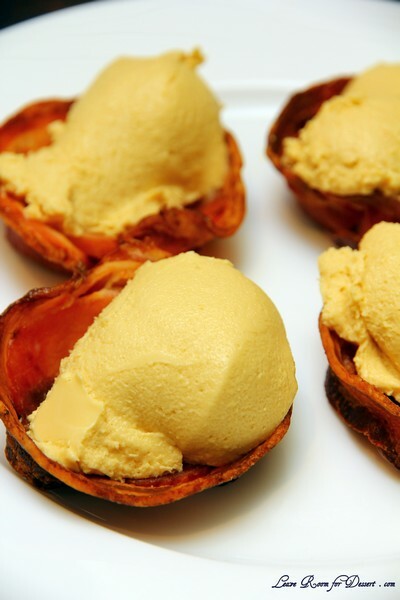 This month’s challenge did in fact involve maple syrup mousse in an edible container. If it were any flavoured mousse in any type of container – I already had a few ideas in mind. Although we have a few compulsory items each month for our Daring Bakers challenge and this month we had to make the maple mousse. When I told others about this months challenge I must admit I didn’t get too many people saying it sounded like a lovely dish we had to make this month. 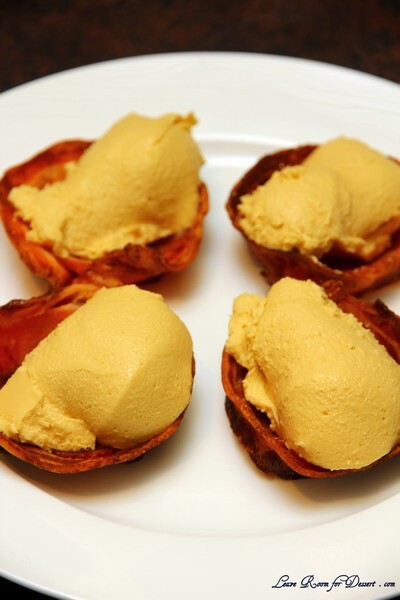 Many people screwed up their faces at the thought of such a large maple syrup to cream ratio plus the addition of bacon (if you chose that type of edible cup). There were many suggestions on how to make this beautifully presented and a good flavour combination, although I kept putting off the challenge until the day before it was due – the last day of our long weekend. And by that stage I was drained of cooking – hot cross buns, sorbets, honey comb, ice cream, lamb shoulder, pork belly and a few other experiments in the kitchen. I decided to go by the recipe which said to use real maple syrup rather than maple flavoured syrup – although here in Australia a good quality real maple syrup costs about $10 for a cup. Yep – a little too expensive for a mousse that I didn’t think I would like that much. So I decided to halve the quantity of mousse. 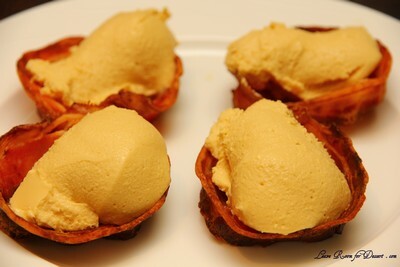 After tasting the maple mousse (which I had a few troubles with, as I let the maple syrup + gelatine mix cool too much and had to gently re-heat it), we decided to go ahead with the bacon cups, hoping it would cut some of the sweetness. Unfortunately I don’t think the mousse was for my tastes, although others that tried it, said it was better than they expected. It is quite unlikely I will make this again. 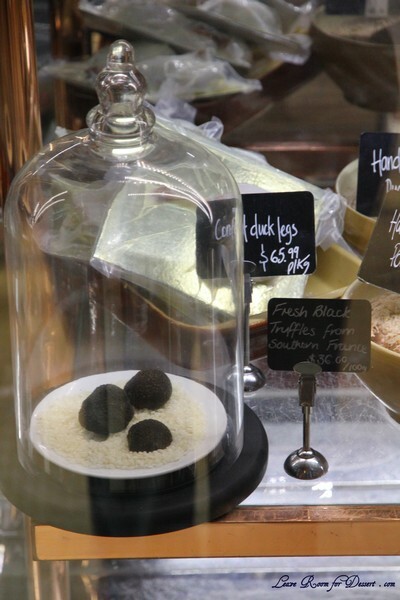 I will have to find time to make my own mousse and edible cups – although I think they will have a chocolate theme. Thanks to our host this month for making me try something different. 1. Pre-heat the oven to 400 degrees F/200 degrees C.
2. Take a muffin pan or 6 small ½ cup capacity heat-proof bowls, turn upside down and carefully form aluminum foil covers on the back of 6 muffin cups or the bowls. 3. Taking 2 strips of bacon at a time crisscross the strips over the backs of the muffin cups and cut to size a tad longer then the bottom part of the cup. Now use 1 to 2 more strips to cover the sides of the muffin cups in a weaving fashion. You want a full tight weave because bacon shrinks a lot. For smaller cups I used a shot glass with a square of bacon for the bottom and I wrapped 1 strip around the side. 4. 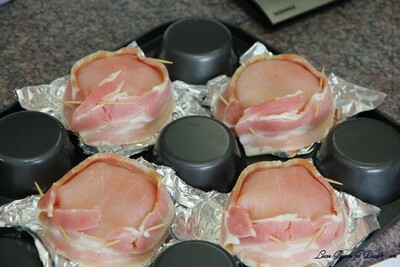 Tuck the ends of the bacon strips inside otherwise they will curl while cooking. A good idea is to insert 4 toothpicks where the crisscrossed bacon meets in the weave. 5. Place muffin pan in a cookie tray to catch drippings. 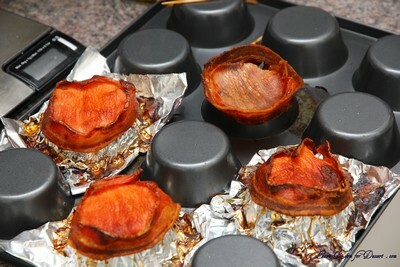 Bake in oven for about 25 to 40 minutes, or until the bacon is golden and crisp but not burned. 6. Cool completely, a good hour, before removing your cups delicately from the foil. The post was sponsored by Ferrero. The ANZAC Day and Easter long weekend are just around the corner. For me, this weekend will involve spending time with friends and family, working in the garden and picking which roses I’d like to plant, cooking of course (choc chip hot cross buns are on the list), and lastly, eating chocolate Easter eggs!!! Oh and might I add, I hope to relax a little too 🙂 Hopefully I will get a chance to read everyone’s blogs which I have been unfortunately missing out on recently. 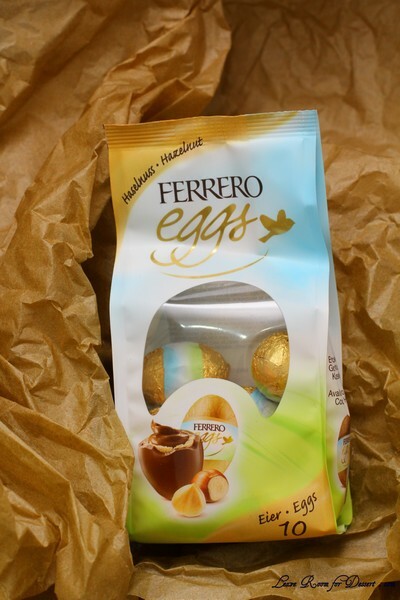 Being so close to Easter, I was sent some of Ferrero’s new Ferrero Eggs to try, and even better, the chance for one of my readers to win a Ferrero Easter Gift Box. 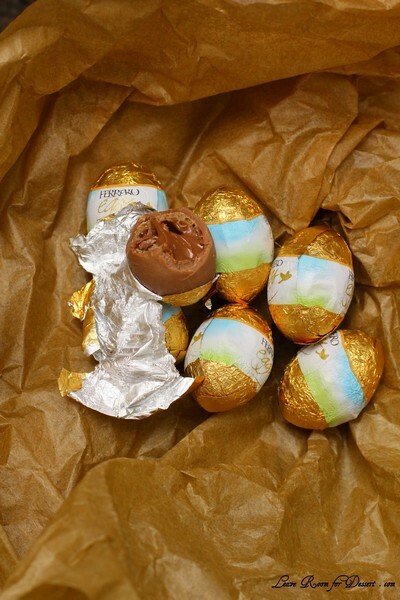 I was happy to see my favourite feature of the Ferrero Rocher chocolates were included in the Ferrero Eggs – the creamy hazelnut filling, which was surrounded by wafer and milk chocolate. 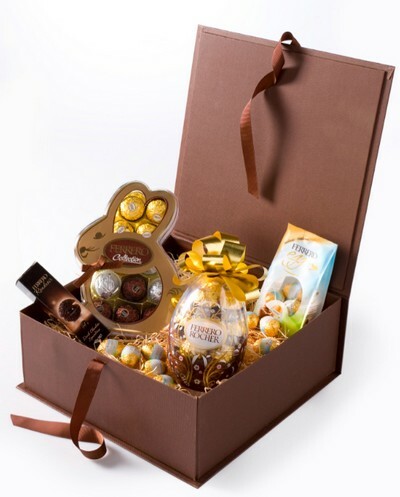 The Ferrero Easter Gift Box and many other Gift boxes can be purchased on the Ferrero Boutique website. There are three prizes to be won – the Ferrero Easter Gift Box featuring a packet of 10 Ferrero Eggs together with the Ferrero Collection Bunny, Rocher Egg Gift Box and a box of Ferrero Rocher and Ferrero Rondnoir, all wrapped in a beautiful brown gift box, and two packs of Ferrero Eggs for the second and third prize. What is your favourite treat to make or buy over the Easter break? The competition will end at 5pm Tuesday 26th April 2011. The winners will be chosen by myself and Ferrero and notified by email for their address. The prize will only be sent within Australia. 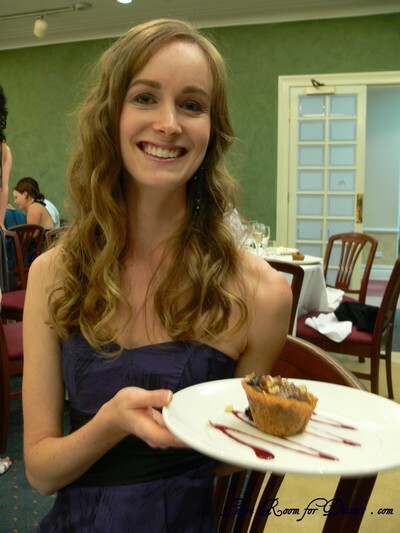 I was grateful to receive a Gourmet Safaris voucher from some lovely friends recently. You can choose either a bus tour or a walking tour, and I decided a bus tour would be nice (even though a bit of walking whilst eating is a good idea). I love French food, and seeing as the earliest one I could make was on a Wednesday, I decided a break in the middle of the work week would be nice. We had one of the smallest groups our host Marie had taken, and at 18 people it was a nice number being not too big. 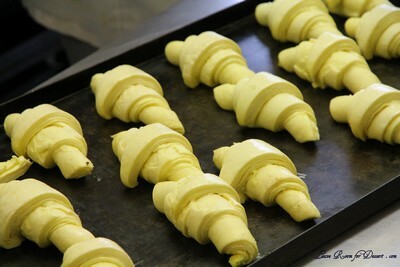 We started our day with a visit to Ganache Patisserie in Castlecrag, where the owner and chefs showed us how they make croissants and other pastries and the techniques they use to decorate their cakes. It was a very interesting process where you watch as the cake is transformed. Each addition makes it looks more complete, until the finishing touches are added and the cake is complete. 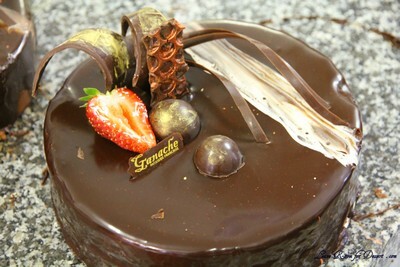 After the demonstration, Garanche Patisserie served us a French breakfast, or by this time for me, it was morning tea. 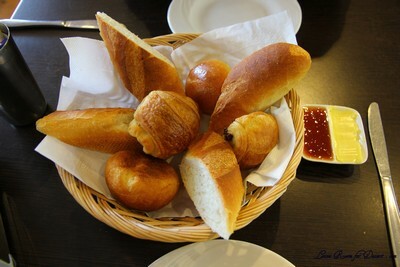 We were given a large bowl of hot chocolate or coffee (or whatever you wanted to order), with a basket of cut baguettes, chocolate croissant and another croissant type pastry served with butter and apricot jam. I never buy or eat apricot jam as I can’t stand any that I have tried – until now, this was amazing jam – so amazing I had to buy some and take it home. The baguettes were the best I have tried. Crispy on the outside and soft in the middle, and they worked perfectly with the butter and jam. We were unfortunately too late (at 10.30am) for me to try an almond croissant (a favourite of mine), as they had sold out. I would have loved to have tried it. Perhaps I will have to go back on my own sometime. 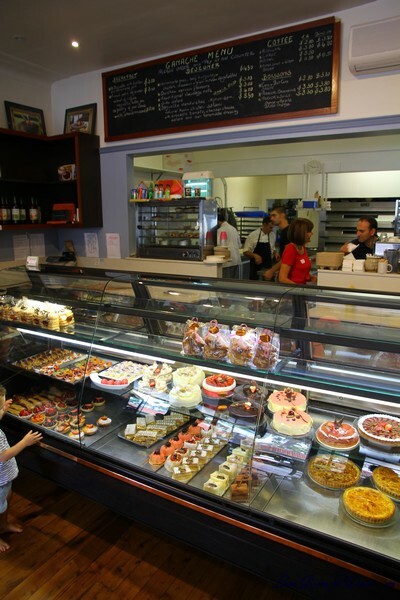 Next we went to a butcher that was nothing like anything I had ever seen – Victor Churchill in Woollahra. 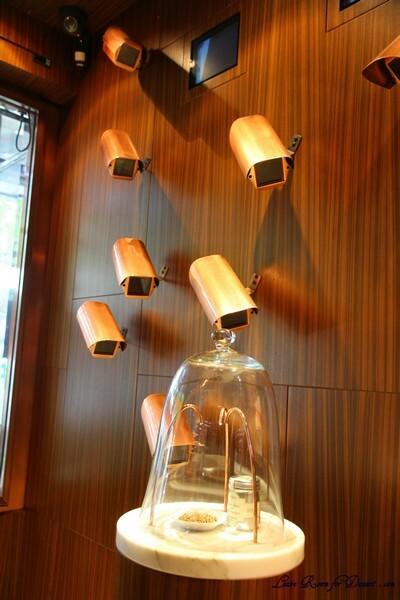 The display in the front window looked like it was from a jewellery store. With a Valentines theme, different types of meat were placed on ingredients they were “made for”. 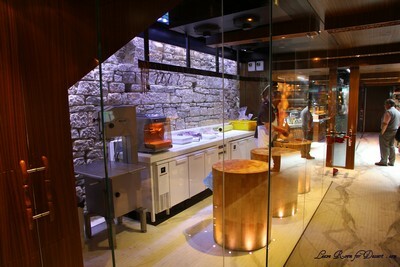 Beautiful meats were visible in the cold-rooms behind glass, while the experienced butchers prepared meat in front of the customers behind the glassed preparation areas. They had their own drying and salting room, which had glass walls, except for the one at the back which was made of salt “bricks” which help remove the moisture for the meat as they hang and age for 28 days. We were able to try some of their prosciutto and pork rigullettes, which were both gorgeous. The Essential ingredient in Rozelle was next, and for most of us foodies was somewhere we had been before. To begin with there was a demonstration of some of their French items, which would be good for someone who is in need of some new items, although many of the brands were just too expensive for me. I was lucky to get a Le Creuset pot for Christmas which I am very grateful for, so I didn’t really need to buy any more cookware. I did stock up on a few other items for my pantry though and a few nice serving-ware pieces. 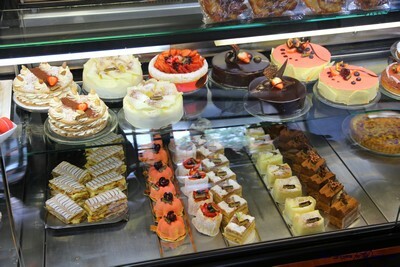 For lunch we went to La Grande Bouffe, just down the road from the Essential Ingredient. The staff and chef were friendly and very attentive. We were greeted with a glass of champagne and baguette. The Chef came and described what we were having for lunch and was happy to answer any questions. 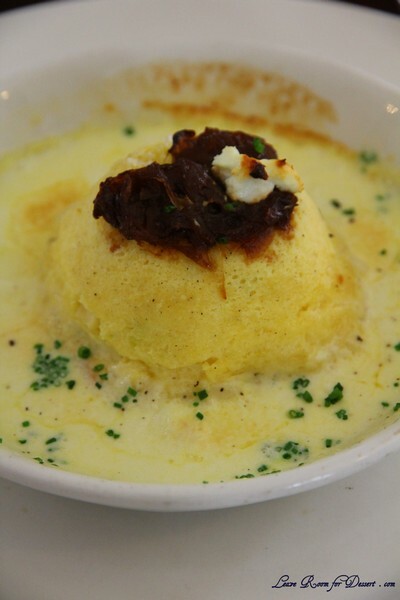 We were served a Gruyere cheese soufflé to start with, which had a beautiful in texture and taste. Next came the main with white or red wine. 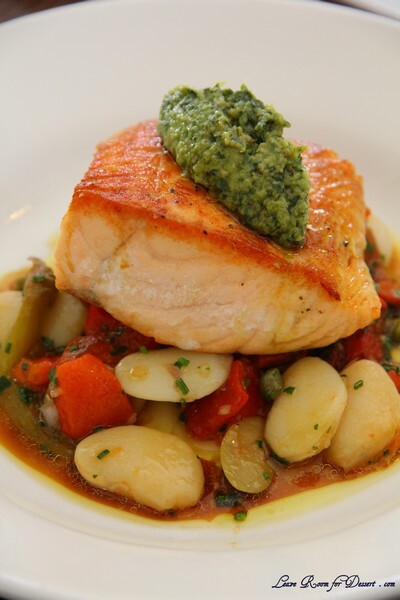 The main was salmon with pesto, caper, olive, capsicum salad. Everything was cooked beautifully and the wine kept coming. After lunch came chocolate (the chocolate only came before cheese due to the locations of the places we were visiting). 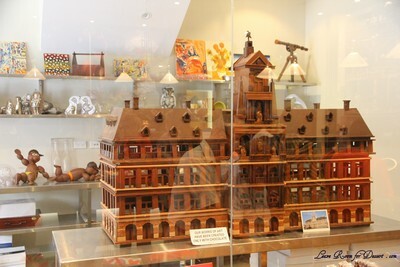 We visited Belle Fleur Chocolates in Petersham and met Jan Ter Heerdt who is a very experienced chocolatier and owner of Belle Fleur Fine Chocolates. Jan went through how chocolate is made, with samples of the cocoa bean, 99% cocoa chocolate, single origin chocolate, 66% cocoa chocolate and an amazing 4 or so flavoured and hand made chocolates from their range. 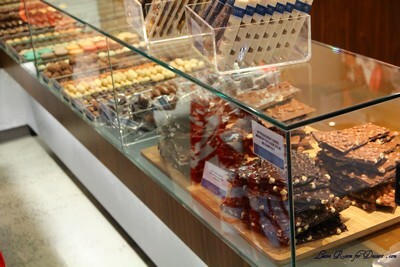 One of these was my absolute favourite, which is what Jan called a traditional Belgium chocolate. 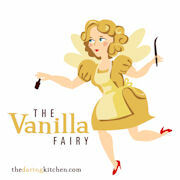 It was dark chocolate encasing caramel, cream and a milk chocolate cream topping. It was lovely. Last but not least we visited Simon Johnson in Alexandria for our cheese fill for the day. We arrived to be greeted by a very large amount of cheese to sample. I was more than happy to have a past bad experience with goats cheese now corrected. 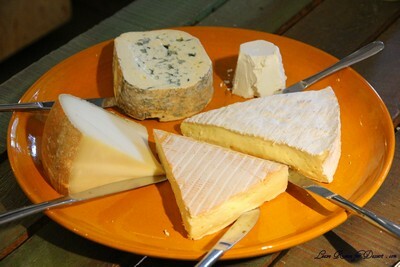 My two favourites (and the most mildest) were the goat’s milk cheese: Caridoux and the cow’s milk Fromage de Meaux. I really enjoyed the tour, and have seen quite a few others on the Gourmet Safaris website that I would love to go on.